Permanently discounted starter set: foam bottle (foamer) and refill bottle allows a long-term reduction in odour. Take advantage of our discount rates when you buy 2 items in the following combination! BromEX refill (150ml) washing foam – save the environment! Experts' advice: Permanent body odour (bromhidrosis) is often associated with abnormal sweating. 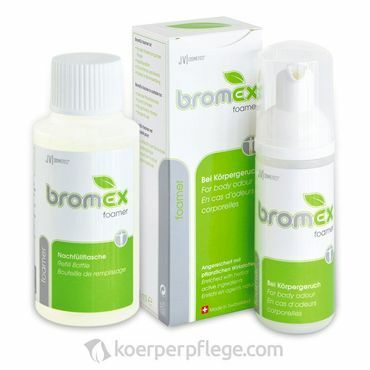 A combinated treatment by using BromEx foamer with anti-perspirants is highly recommended. Our special remedies AHC sensitive and AHC forte will reduce excessive transpirantion to a minimum. Please help other customers and rate BromEX foamer + refill against body odour. Your rating will be published anonymized.